Cambium exposed to show the necrotic, discolored areas. Photo by Iain MacSwann, 1967. Bacterial canker is often observed on young trees starting to bear fruit. Note the extensive gumming along the trunk. This bacterium can also cause spots on fruit and leaves. Photo by Iain MacSwann, 1984. Gumming due to bacterial canker on either side and in the middle of a score mark meant to manage the disease. Cause Pseudomonas syringae pv. syringae, a bacterium. This disease can be the limiting factor against establishing a cherry orchard anywhere in the Pacific Northwest. Two common genetic traits increase the bacteria's ability to cause disease. Most produce a powerful plant toxin, syringomycin, which destroys plant tissues as bacteria multiply in a wound. Bacteria also produce a protein that acts as an ice nucleus, increasing frost wounds that bacteria easily colonize and expand. Factors that weaken or injure the tree predispose it to developing cankers. These factors include wounds, frost damage, early dormant season pruning, heading cuts, incorrect soil pH, and poor nutrition. 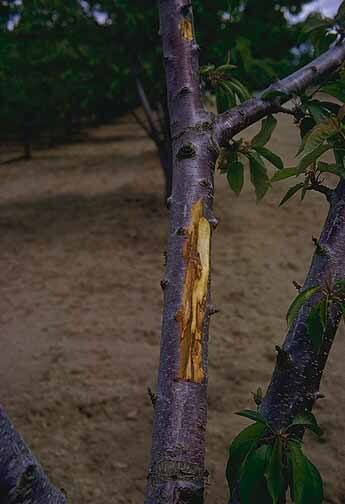 Important avenues of infection leading to tree death include natural leaf scars in the fall and heading cuts made in the spring after planting a new orchard. Infection by other pathogens including Cytospora, Verticillium, and Nectria can lead to more bacterial canker. Ring nematodes have also been associated with increased susceptibility to bacteria canker in both cherry and peach. Sources of bacteria include old cankers, healthy buds, systemic infections within trees (with or without cankers), as epiphytes on leaf surfaces, weeds, grasses, and even soil. Wind, rain, insects, infected bud wood, and infected nursery stock can spread bacteria. Pruning through cankered and then through susceptible, healthy tissue does not spread the disease. Although bacterial canker is more serious on sweet cherry trees, it also affects almonds, apricots, peaches, plums, and prunes. The same bacterium also can cause a blight of many other fruit, vegetable, and ornamental crops. The cherry cultivars Royal Ann, Bing, Lambert, Napoleon, Sweetheart, and Van are very susceptible to bacterial canker. 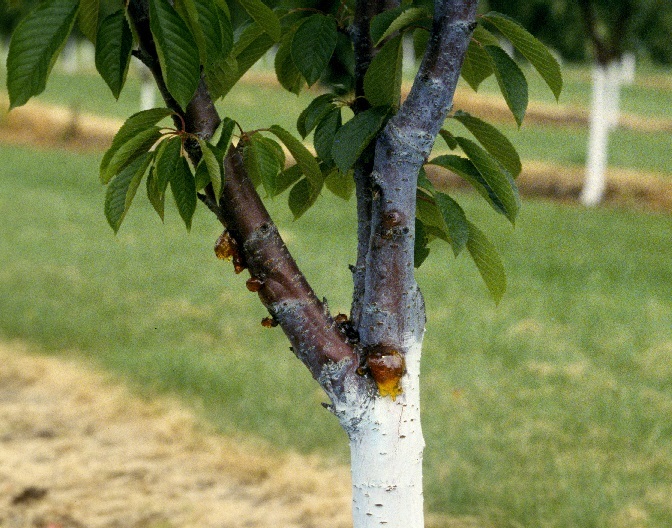 The cherry cultivars Corum, Regina, Rainier, Sam, and Sue appear to have sufficient tolerance to canker to be grown commercially without serious tree loss. Mazzard seedlings, particularly the F12-1, can be used as resistant rootstocks. Size controlling rootstocks may also have useful resistance but field performance trials are lacking. Scions on Gisela 6 rootstock have exhibited increased susceptibility. The cherry cultivars Royal Ann, Bing, Lambert, and Van are quite susceptible to dead bud. 'Black Republican' and 'Mazzard' seedlings are somewhat less susceptible. Symptoms The most conspicuous symptoms are cankers, gum exudation, and dieback of girdled branches. Dead buds and leaf spots also can occur. In most cases, heavy gumming is associated with bacterial canker formation on branches and twigs. Gumming occurs at the cankers' margins. Other problems can lead to gumming (see Cherry-Gumming). 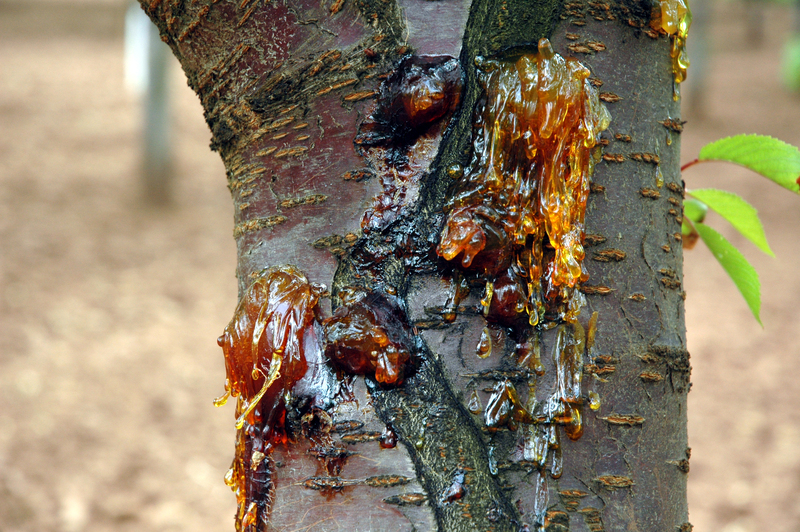 Cankers caused by the bacteria may be on the trunk, limbs, and twigs. Typical cankers are much longer than broad, but a canker may girdle the infected limb or trunk. The cambium at the canker will be discolored and necrotic. Use a pocket knife to reveal this discolored tissue. Cankers develop in winter and early spring. As the tree begins growth in spring, the bacteria population declines and a callus layer forms around the canker's edge. During spring and summer, girdled and nearly girdled limbs may leaf out. Normally, leaves turn yellow, then the limbs usually die. In some instances, these symptoms may not appear until late summer when the leaves' water requirement is high. Dead bud "disease" is first noted as dying buds on spurs in spring. Infected buds usually start to die in February. As the disease progresses, both leaf and flower become infected. Dead bud usually starts in lower limbs and moves up the tree and to adjacent trees in successive years. Often, trees in the lower orchard, where air drainage is poor, are the first to be infected. If all buds on a spur are killed, the spur will die back next season. Cankers very seldom form, but the diseased buds may produce a slight gumming. Repeated death of buds may result in misshaped growth and sometimes fasciation. In severe cases, 90% or more of buds on a tree may be killed. Leaf and fruit spots are not common and are not numerous if they develop. Spots on leaves are at first water soaked, then become dry and brown. Spots on fruit are dark to black and depressed or pitted. Cultural control Bacterial canker is best managed through the use of many different tactics. Plant resistant cultivars and/or rootstocks. For example, F12-1 Mazzard rootstock with scions from virus-tested (and found to be free of all known viruses), canker-free trees has been very useful. Make buds or grafts at least 12 to 15 inches away from the trunk. Mazzard seedling rootstocks have also been useful. Do not interplant new trees with old trees, which are a major source of the bacteria. Locate orchard in an area less likely to be affected by frost. If planting in the spring, plant orchards after date that frost is likely to have occurred. Prevent winter injury by painting trunks white and avoiding late season fertility. Test soil for ring nematodes before planting. Also test for pH and other physical characteristics that can be corrected prior to planting. Provide optimal soil conditions for growing cherries including attention to pH and nutrition. Annually monitor for adequate nutrient levels such as nitrogen. Keep irrigation off above ground parts for the first few years. Delay dormant pruning until January or February. Summer pruning is even better and should be after harvest, when weather is dry. Make heading cuts after planting only during dry weather when rain will not occur for at least a week after pruning. Make heading cuts close to a lateral bud. Completely remove infected trees or branches girdled and killed by cankers. Do not allow trees to regrow from roots or trunks left after a major trunk canker has been removed. In summer, small cankers may be cut out using the following method. Cut away bark above and around the edges of the infected area. Use sharp tools, and leave wound margins smooth and neat. Wounds should be left uncovered to dry out during the summer. Try not to have sprinkler irrigation soak the wounds. Sterilize all pruning tools between cuts with an appropriate disinfestant. Cauterizing cankers using a hand-held propane burner has been used with some success in New Zealand. Scoring tree trunks has been practiced by Willamette Valley, Oregon growers for several years. Grower testimonials point to some benefits but there has been no research on the efficacy of the practice. A sharp pocket knife is used to make a vertical shallow cut in the tree trunk. The resulting wound tissue that develops is supposed to resist canker development and prevent trunk girdling. Knives should be disinfected between trees. Chemical control Copper-based products have not worked well under conditions favorable for disease development. Bacteria resistant to copper products have been detected throughout our cherry growing regions, which compromises chemical control tactics. In small plot disease control trials it is not unusual to find copper-treated trees with more disease than trees without any treatment. Heavy use of copper products is not recommended as concentrations in the soil can build up to toxic levels after several decades of use. Resistance to antibiotic can develop quickly even with minimal use. Minimize the use of Kasumin by using it to protect trees after planting when making heading cuts and once during early flowering. Focus on cultural control tactics first and supplement with chemical control. Traditional recommendations encourage the first spray to occur in October before fall rains followed by another application in early January. Growers should consider adjusting the timing of sprays to coincide with leaf fall. Thorough coverage is needed. Protecting heading cuts made after planting a new orchard is also important. Protect both orchard and nursery trees (sweet cherry, prune, and plum). Some growers use low rates of copper-based products during bud break to reduce symptoms of dead bud. Champ WG at 8 to 16 lb/A. Group M1 fungicide. 48-hr reentry. C-O-C-S WDG at 8 to 15.5 lb/A plus dormant spray oil. Group M1 fungicide. 48-hr reentry. Copper-Count-N at 6 quarts/100 gal water. Use only 2 to 3 quarts/100 gal water during bloom. Oregon only. Group M1 fungicide. 48-hr reentry. CS 2005 at 51.2 to 64 oz/A. Group M1 fungicide. 48-hr reentry. Cuprofix Ultra 40 Disperss at 5 to 8 lb/A. Group M1 fungicide. 48-hr reentry. Kasumin 2L at 64 fl oz/A in 100 gal water after planting when making heading cuts and once during early flowering. Do not use alternate-row applications, or after petal fall, or within 30 days of harvest. Do not use in orchards fertilized with animal manure. Group 24 fungicide. 12-hr reentry. Kocide 3000 at 3.5 to 7 lb/A plus 1 pint superior-type oil/100 gal water. Group M1 fungicide. 48-hr reentry. Vacciplant at 14 to 60 fl oz/A plus an effective bactericide. Can be used day of harvest. Unknown efficacy in the PNW. Group P4 fungicide. 4-hr reentry. Surface disinfectants such as Oxidate 2.0 at 128 fl oz/100 gal water are registered but have very short residual activity. Efficacy of these products has not been extensively tested in the PNW. Frequent use (every few days) is on the label, which still may not be effective during conditions favorable for bacterial growth and infection. References Kennelly, M.M., Cazorla, F.M., de Vicente, A., Ramos, C., and Sundin, G.W. 2007. Pseudomonas syringae Diseases of Fruit Trees: Progress Toward Understanding and Control. Plant Disease 91:4-17. Lillrose, T., Lang, G.A., and Sundin, G.W. 2013. Strategies to minimize bacterial canker in high density sweet cherry orchards. Acta Horticulturae 1161:457-462. Spotts, R.A., Wallis, K.M., Serdani, M., and Azarenko, A.N. 2010. 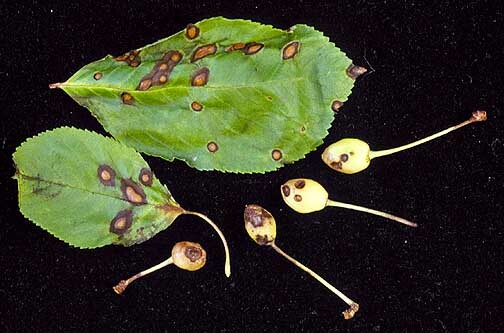 Bacterial canker of sweet cherry in Oregon-Infection of horticultural and natural wounds, and resistance of cultivar and rootstock combinations. Plant Dis. 94:345-350. Evaluation of Kasumin for management of bacterial canker on cherry, 2009.